Our promise is to serve delicious ice cream for health conscious people. Here are some facts to guarantee our promise. 1. We use 20% less sugar compared to other brands (both local and international) and we do not use any sweeteners. 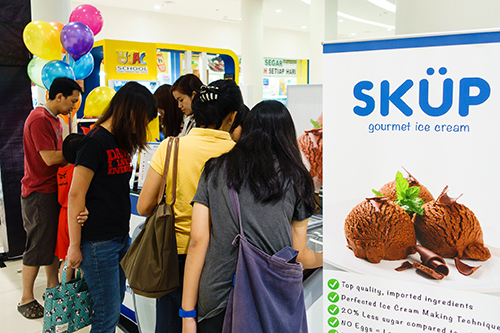 FUN FACT: “MMMmmm…” That’s the sound you’ll hear when people try SKÜP for the first time. Who said healthy food can’t be delicious? 2. 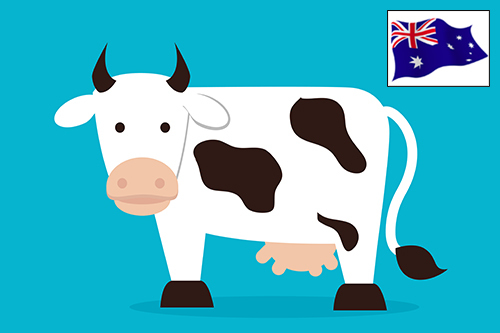 We use the best Australian-produced milk for our ice cream, imported straight from Australia. This milk is from REAL Australian cows in Australia, Not Australian cows imported to China, Indonesia or elsewhere. Why Australian milk? Because it has been tested and proven safe from melamine and other metal contaminations, harmful bacteria and fluctuated hormone content. 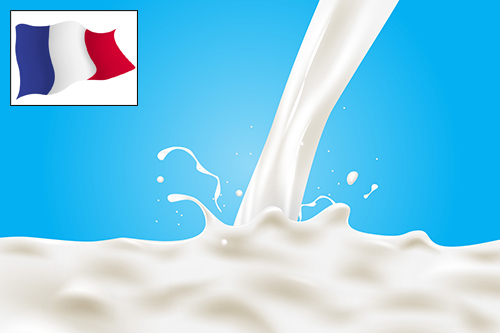 As the main component of our ice cream, this milk is very safe for your kids and family. 3. Our chocolate flavored ice cream uses the premium African cacao, the world’s best cacao. What makes it the world’s best? Its texture and creamy, nut-like chocolate flavor. Ideal for making premium chocolate products. FUN FACT: We sell 374 cups of ice cream during our first ever event in Ciputra World, Surabaya. 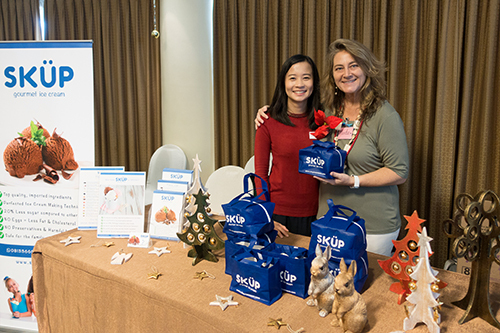 We never imagined that our small stand will be surrounded by so many eager people during our first event! 4. “Cream” is an integral part of ice “cream.” We have searched and tried as many as cream you can imagine, from diary cream to non-diary cream. But nothing beats diary cream and all its goodness. We use Normandian cream from France, a place that is best known to produce world class diary products. Our cream is processed, packed and shipped under controlled regulations to ensure that it still tastes like it is in France! 5. Eating one cup of SKÜP ice cream daily will not make you gain weight. We have calculated this in our formula. As they say, an apple a day keeps the doctor away. A SKÜP a day keeps you happy. FUN FACT: On average, an adult buy 4 cups of SKÜP Ice Cream: 1 for them, 1 for the husband/wife and 2 for the kids. However, the kids ended up eating more than their share, leaving the husband and wife to share only one cup of ice cream. Moral of the story: more is always better than less. 6. 99% of other ice cream brands use eggs as their emulsifier. We’re not. SKÜP is FREE of eggs. Egg yolks can give ice cream a smoother, creamier texture but it needs to be used in large quantity. And this translates to high cholesterol content. Also, you won’t be able to enjoy ice cream if you’re allergic to eggs. By perfecting our ice cream making technique and formula, we can achieve the smooth and creamy texture even better without eggs! 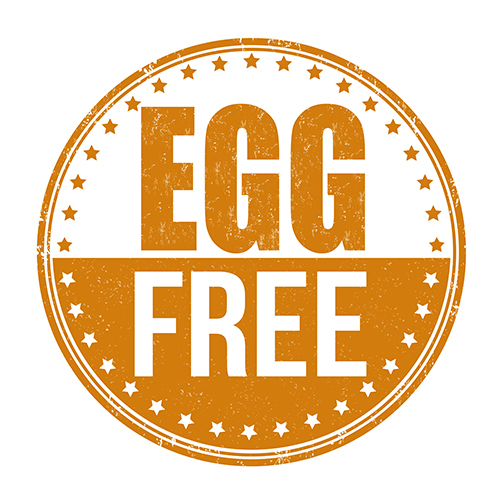 By not using egg yolks, we cut off at least 185mg of cholesterol per cup and that’s a lot. Our ice cream has less fat and cholesterol compared to other brands. Goodbye eggs! Goodbye cholesterol! Hello SKÜP! 7. 99% of other ice cream brands use preservatives in their product. We’re not. SKÜP is FREE from preservatives. We are so determined to make SKÜP Ice Cream so safe and so enjoyable for everyone and we do not believe in using preservatives in any forms! Our ice cream is fresh and virgin, just like its ingredients.